What's New | Kona Brewing Co. 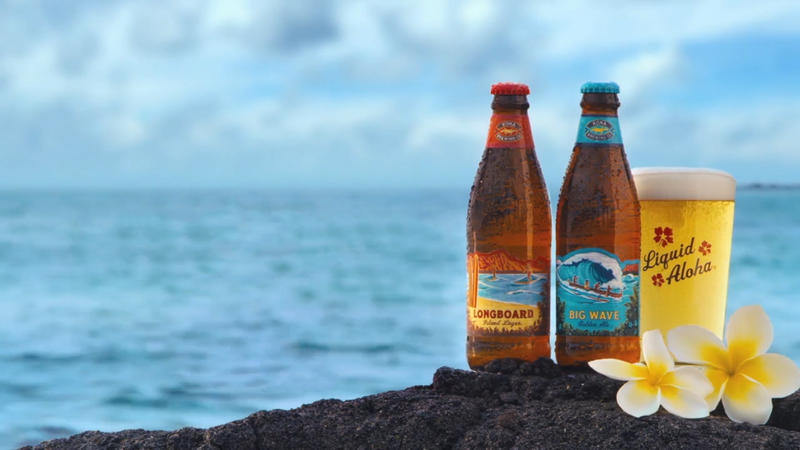 Whether it’s enjoying a little vacation in every sip, rethinking your ‘to-do’ list, or disconnecting for a few moments, Kona Brewing Company’s beloved “Bruddahs” will show you the way in three new national TV ads launching during March Madness 2019. For Kona Brewing Co.’s first-ever national TV campaign, the “Bruddahs” – Hawaii’s own David Bell and Blake “Brutus” LaBenz – return to the screen and poke a little fun at today’s always-connected consumer with some island- and Kona-inspired solutions to bring a little more aloha into our everyday lives. The three new 30-second ads will air throughout the NCAA’s March Madness tournament on National TV and on Local TV in select markets, with the first national spot running March 21st. Read the full article from Brewbound here. "This year, Kona Brewing Co. will commemorate its 25th anniversary milestone with a year-long celebration to share the spirit of Aloha with more consumers than ever before. As part of the celebrations, Kona will be expanding on its giving program to increase support with long-time local philanthropic partners in Hawaii and begin new partnerships with community organizations across the U.S. Additionally, Kona will open its brand new brewery just steps away from its current Big Island location this year, increasing production 10-fold and making Kona one of the most sustainable breweries in the world. And finally, to mark its 25-year milestone, Kona will release a special Hibiscus Brut IPA, initially as an exclusive anniversary beer in Hawaii and then later on the U.S. mainland." Read the full article from Brewpublic, here. "Hawai’i’s own Kona Brewing Company on the Big Island is tapping into the power of the sun to allow people to tap into its beer without guilt. The company is installing a new solar-plus-storage installation with the help of EnSync Energy and Holu Energy that will allow the company to crank out nearly 7,000 cans of ‘Liquid Aloha’ per hour." Now Available in Hawaii: 18-Packs of Longboard Island Lager and Big Wave Golden Ale! Kona Brewing Co. is excited to announce the release of 18-pack cans of Longboard Island Lager and Big Wave Golden Ale in Hawaii! Congrats to all of the paddlers who participated in the 43rd Annual Maui Jim Molokai Challenge. Kona Brewing Co. becomes the official craft beer for the Association of Volleyball Professionals (AVP). Kona Brewing Company announces a multi-year partnership with the Association of Volleyball Professionals (AVP), becoming the official craft beer of the AVP tour. The relationship between AVP and Kona Brewing Co. enables fans to embrace their Aloha to its fullest potential while providing unique experiences to all guests. Kona will also bring the Aloha Spirit to each of this year’s AVP tour stops with the “Kona Oasis". Gold Cliff IPA features real pineapple, along with bright, tropical fruit aromas of Mosaic and Citra hops and a hint of smooth caramel malt. Kona Brewing Company today announces the latest addition to its Aloha Series with Gold Cliff IPA, a bold, juicy beer that highlights the adventurous spirit of the Hawaiian Islands. The new beer expands Kona’s ever-growing offerings to include a big, hoppy IPA with a Kona twist– juicy, tropical pineapple, an homage to the southern tip of Lanai, where the island’s first pineapple field overlooks cobalt blue waters. The 7.2% ABV Gold Cliff IPA pairs caramel & acidulated malts with easygoing aromas of Mosaic, Chinook, Topaz, and Citra hops for a cool embrace of Pacific paradise. What happens when you mix Hawaii’s most delicious craft beer with one of the island’s premier oceanfront resorts? A match made in heaven. Last month Kona teamed up with Hilton Waikoloa Village for a seven-course beer dinner and the result was pure magic. The Hilton chefs, who are all big fans of Kona, prepared the dinner with locally sourced ingredients and paired each course with a specialty Kona brew. Sandi Shriver, Kona’s Brewery Operations Manager, was on-hand to give tasting notes and talk about the brewing process, and Kona Brand Ambassador, Kimi Werner, attended the dinner and managed Kona’s first social media takeover for the day. Her course-by-course Instagram stories had us on the edge of our seats! And this sistah knows a thing or two about ono grinds—she’s the U.S. National Spearfishing Champion and a certified culinary chef. After a year-long search that included evaluating multiple sites across the Islands, Kona Brewing Co. today announced that it has signed a lease with the Queen Lili‘uokalani Trust, a private charitable trust founded in 1909 to serve native Hawaiian children, for a 2.6-acre site in Kailua-Kona. The location, which is just down the street from the original Kona Brewery & Pub, will be the future home of Kona’s new 30,000-square-foot brewery and canning operation. After launching exclusively in its home state of Hawaii in August 2016, Kona Brewing Company is proud to introduce its newest year-round beer, Hanalei Island IPA, to the U.S. mainland starting today in California. Hanalei Island IPA is a refreshing fruit-forward IPA created in honor of the lush Hawaiian Island of Kauai, also known as the Garden Isle, and Hawaii’s beloved classic POG juice, a blend of passionfruit, orange and guava.